Am I the only weirdo who can try a new dish once and fall so in love with it that I spend years thinking about it afterwards and/or trying to re-create it? I assume not, but I do think it takes a certain type of personality – a memory that’s often more sharply tuned to food than to certain books or conversations or other experiences (which I wish I could remember better) – to be nostalgic even for one-time edible experiences. Actually, maybe that’s the underlying issue here: too much (food) nostalgia. At any rate, it’s happened to me with more than one dish, and more than one ingredient, so that all of these experiences added up together have vastly expanded my food knowledge and cooking repertoire, or at least the cooking repertoire I hope to someday have. And these random encounters with ingredients or dishes that take me by surprise and spark my devotion have really been what has driven me to get into the kitchen and try making something new – probably more than flipping through all of the cookbooks in my cookbook collection could ever do. This exposure to newness is just one reason I appreciate the importance of traveling, of visiting new restaurants, of trying different items from the menu. I think this was a Madison trip back in 2012. We went out to eat as a family, with a few aunts and uncles who were in town, to Marrakesh, a restaurant I’d visited only several times before. Paula (predictably) ordered a falafel/hummus/pita platter, while I became intrigued by the tempting combination of chicken, lentils, and phyllo dough – it would be hard to go wrong with those ingredients. 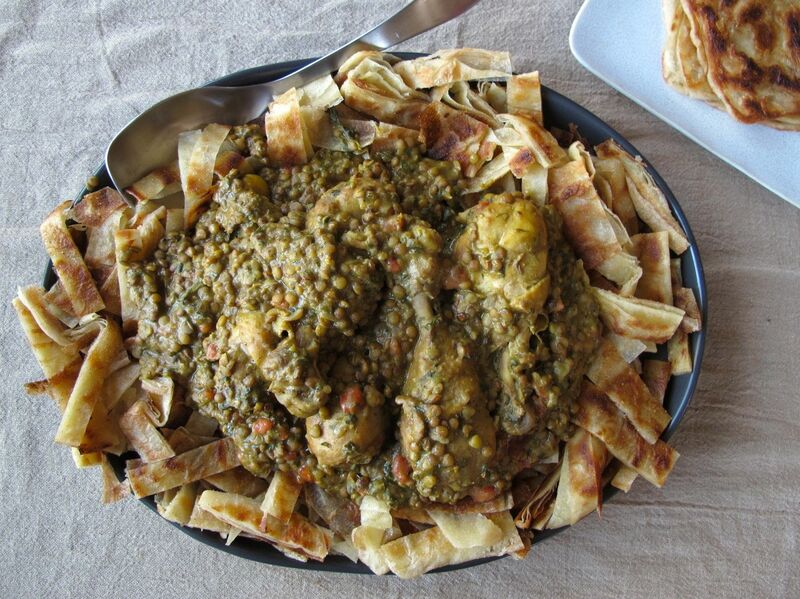 The chicken arrived buried in a bowl (actually a tagine) of the greenest lentils, with buttery triangles of phyllo dough dotted over the lentils to soak up the spices. The flavors were strong: ginger, cumin, and fenugreek. But as a whole, the dish was more rich than spicy. It was comfort food, yet complex. 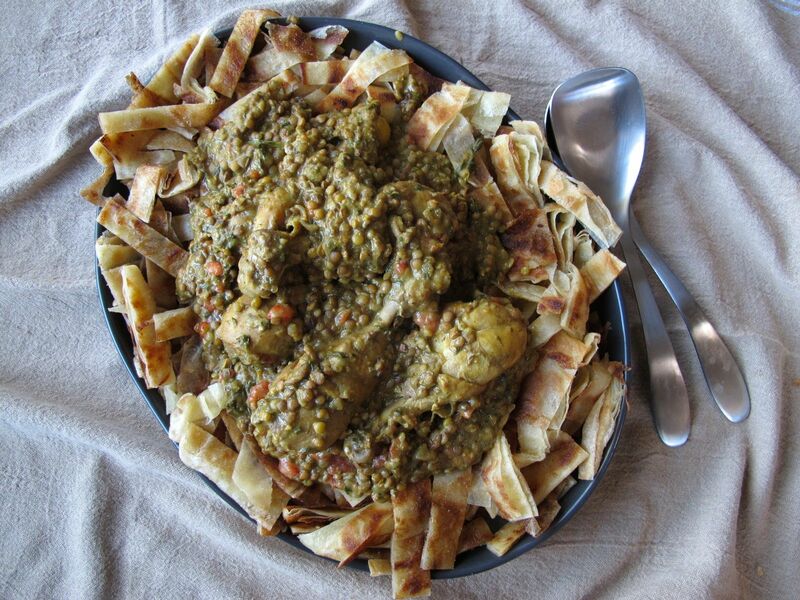 One of my favorite combinations – chicken and lentils, but with flaky pastry dough instead of with rice or bread. It won me over. 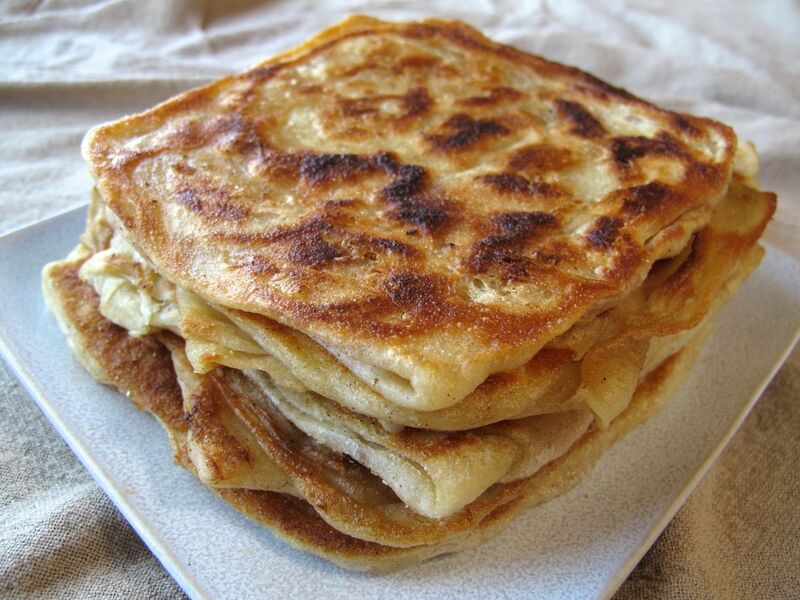 The rfissa recipes we found all explained how to make homemade msemen (also spelled “msemmen”), which are layered, buttery pan-fried Moroccan flatbreads, sometimes referred to as pancakes or crepes (i.e., not the same as the phyllo dough that was in the first rfissa I tried!). The last step before we could share it with you was for Paula to make msemen, which she finally did for me, for our Valentine’s day chicken rfissa dinner this year. Since then, we’ve enjoyed leftover msemen, and the extra msemen from later batches, slathered with honey and sprinkled with cinnamon. 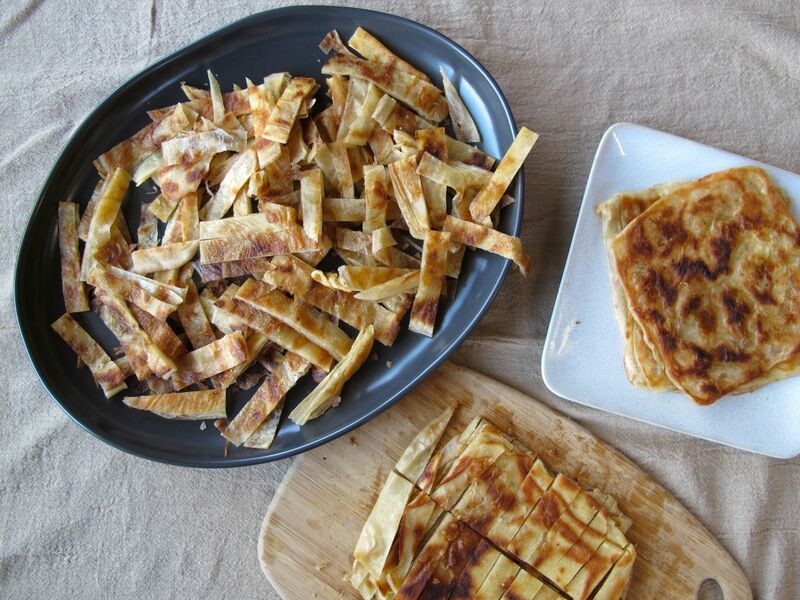 I hope many of you will give this dish a try, despite the recipe seeming a little involved. It’s truly one of my favorites, and I think I like my version now better even than that first one at the restaurant, which was so good that’s it’s been stuck in my memory since 2012. Active and Total time: about 50 minutes. 1. Combine all dough ingredients in a stand mixer (or knead by hand) until smooth (about 5 minutes in the stand mixer; longer by hand). 3. 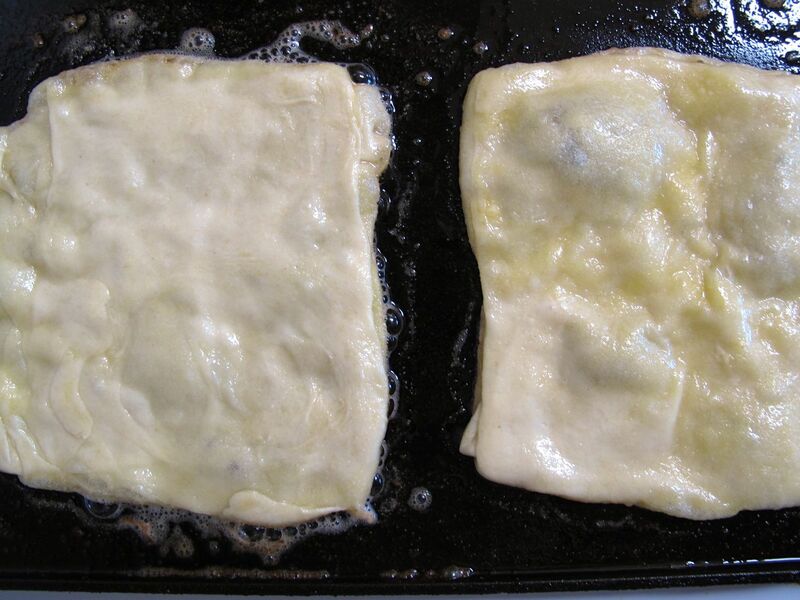 Note: Use generous amounts of both oil and butter throughout this step. Brush some of the oil and melted butter onto a clean counter or surface; make sure your hands are well-oiled as well. 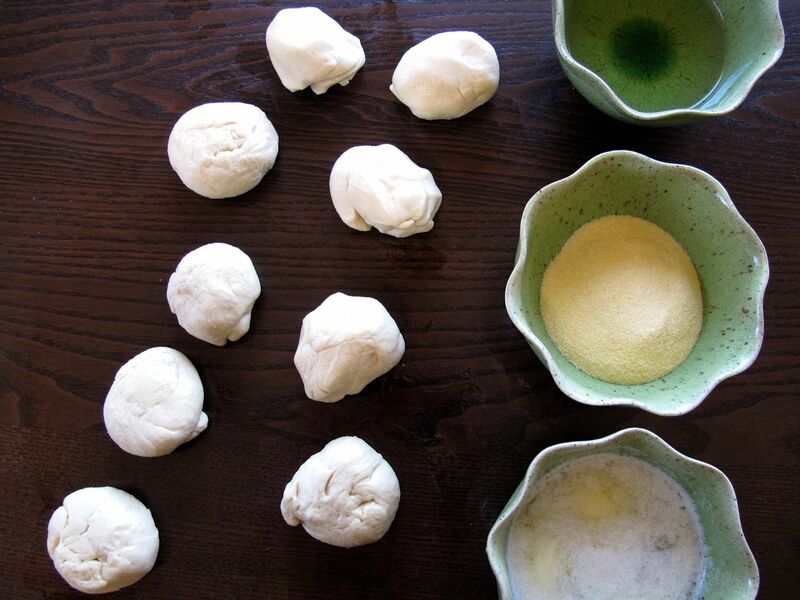 Use your fingers to start to flatten one of the balls of dough, then use the palm of your hand (circular wiping motions work well) to gradually spread out the dough into a large circle — the thinner the better. 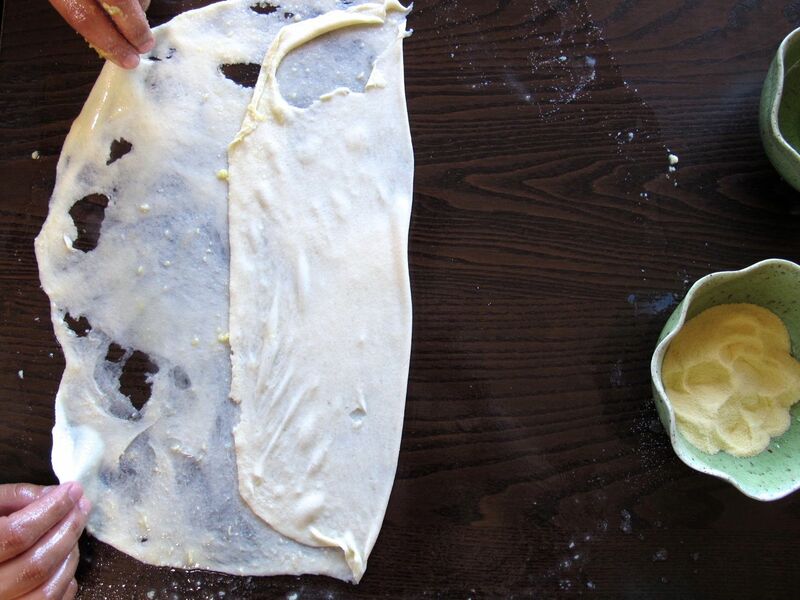 Don’t worry if the dough tears or has holes because you’re going to be folding it up into layers anyway. 4. 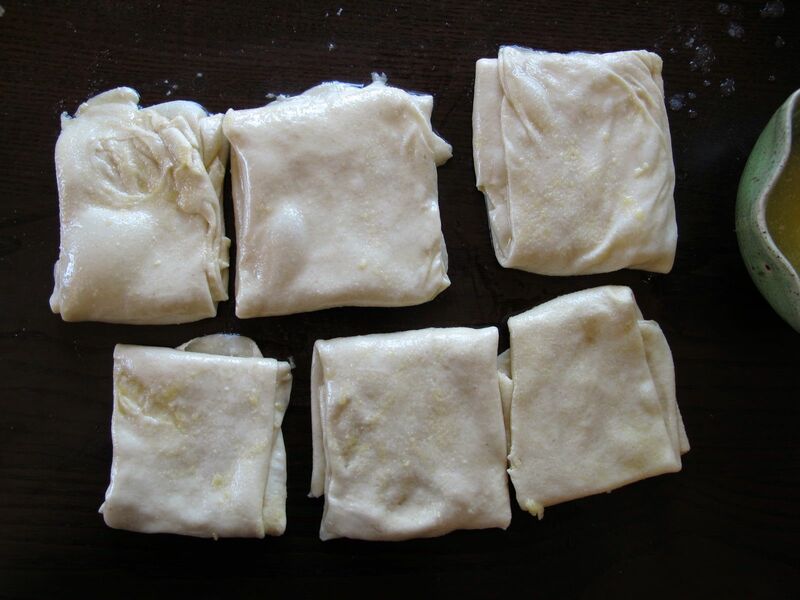 Sprinkle a pinch of semolina flour evenly over the thin circle of dough, then fold the dough in thirds toward the middle once from the left and right edges, and once again from the nearest and farthest edges. 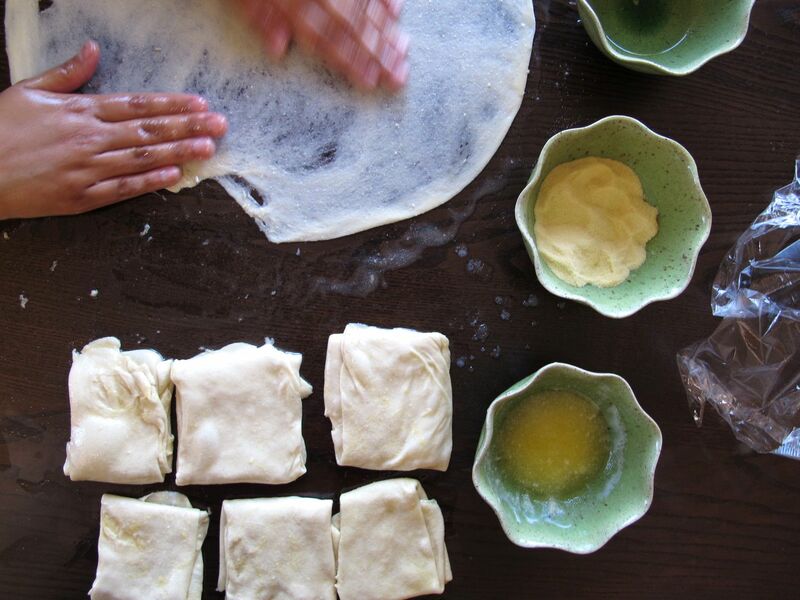 Set the layered square of dough aside, and repeat with the other balls of dough. 5. 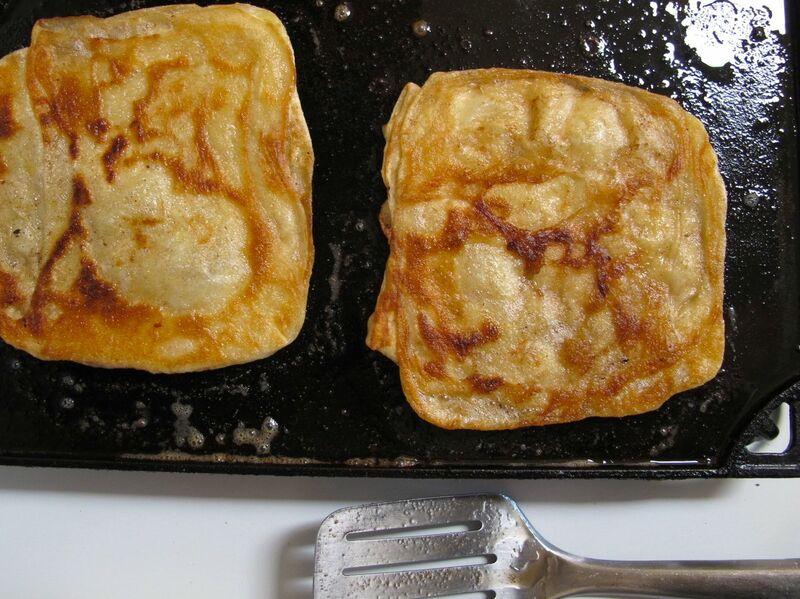 Warm up your griddle or a frying pan, and melt a little butter on the surface. 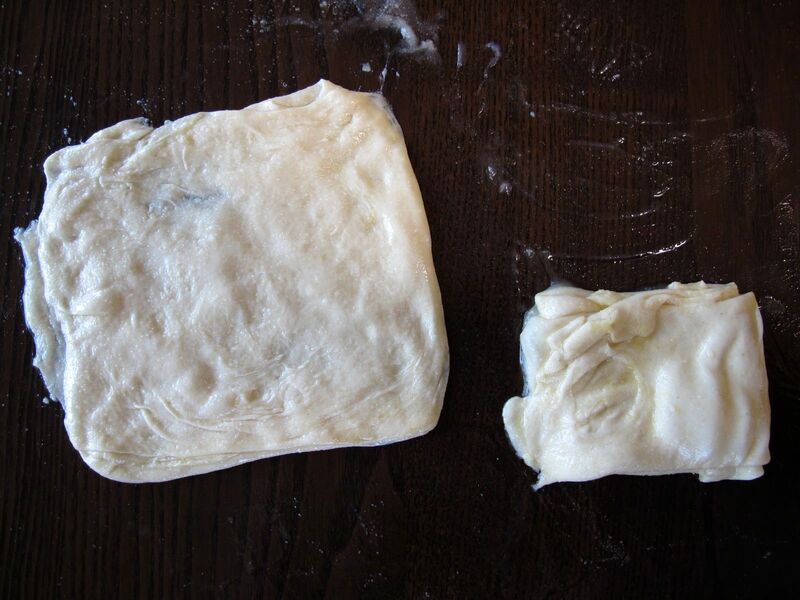 Take a folded square of dough and press it to flatten it out a little more, until it nearly doubles in size. 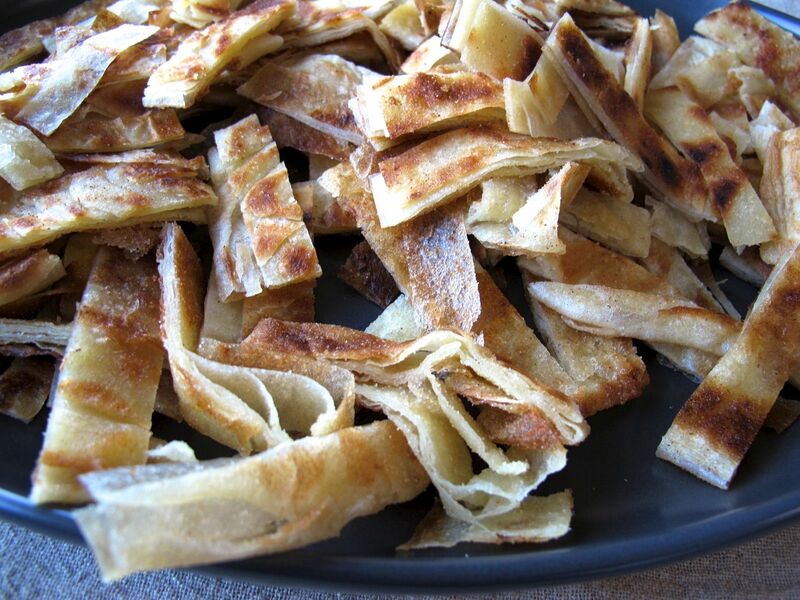 Fry each flatbread for 2-3 minutes per side until golden brown. 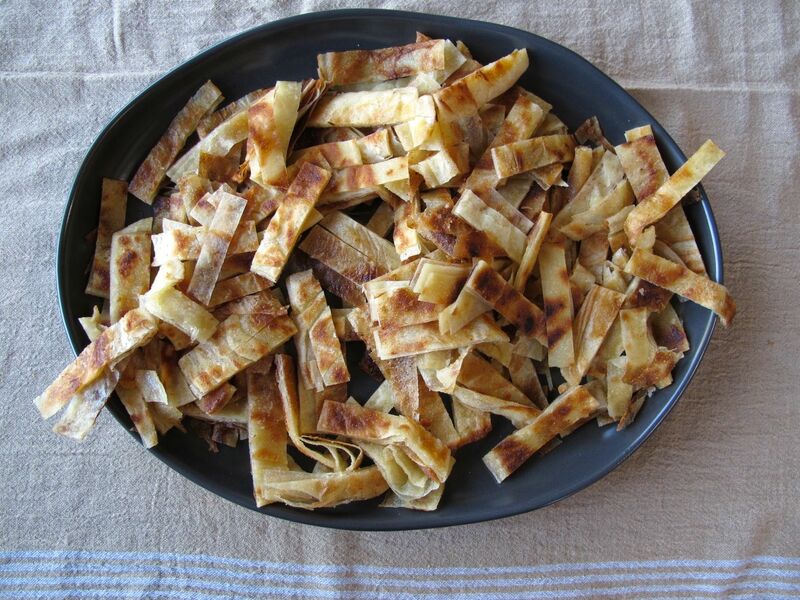 Serve warm with honey or slice into strips to serve with chicken rfissa. 0. 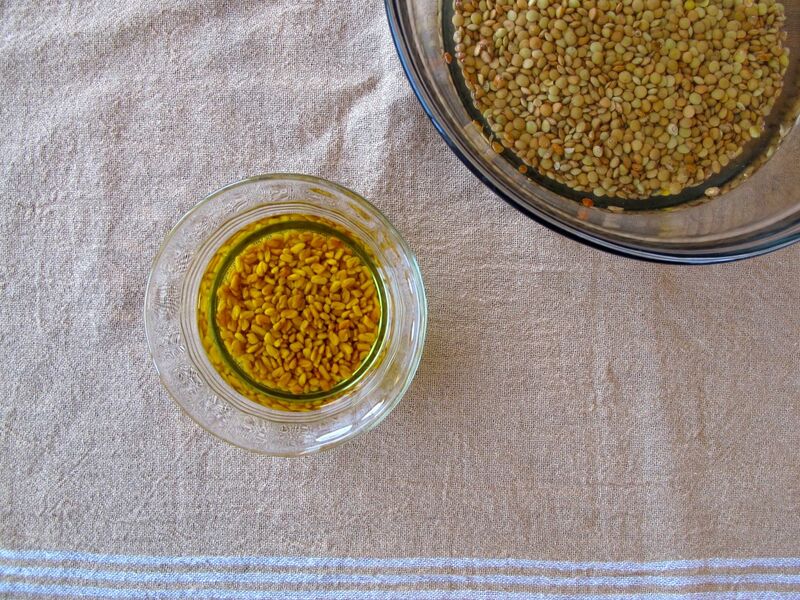 (Rinse and optionally soak the green lentils for 1-2 hours, then drain before using.) 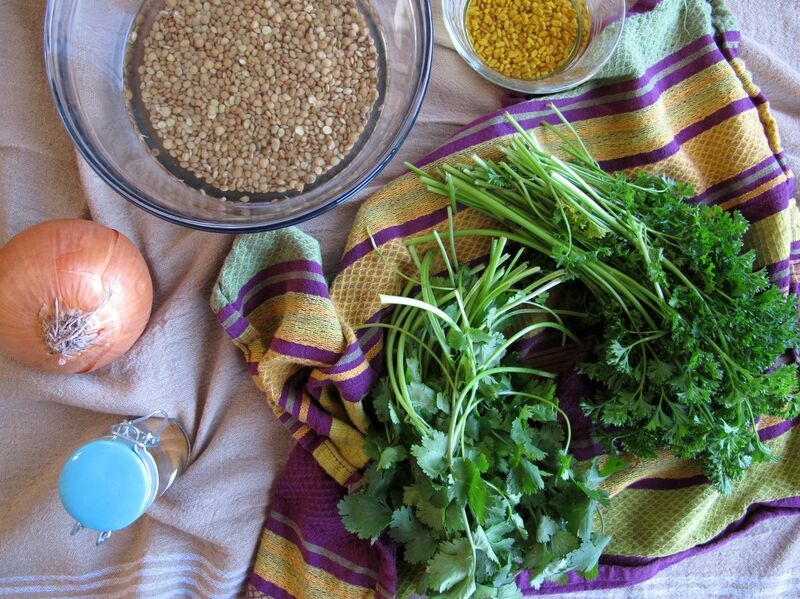 Soak the fenugreek seeds in boiling water (drain and pour over new boiling water several times) for 1 hour, or in room temperature water overnight. After the fenugreek seeds have soaked, drain them, and then grind them in a coffee grinder or a powerful blender (if you’re using a strong blender, add a little water to help them blend). 1. In a large stockpot, heat olive oil over medium-low, then add the diced onion and cook for about 10 minutes until softened, stirring frequently. 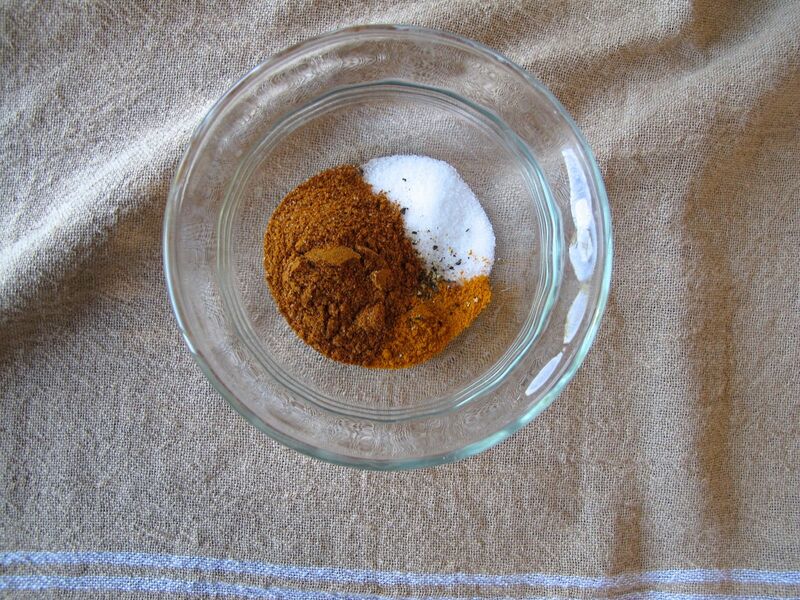 Add the ras el hanout, salt, turmeric, and ginger during the last few minutes of cooking the onion. 2. Add the chicken drumsticks, increase the heat to medium, and “brown” the chicken, or at least turn them several times so that they start to cook and get coated in the oil, onions, and spices (5 minutes). Then cover and reduce the heat a little (another 5 minutes). 3. Uncover and increase the heat back to medium. 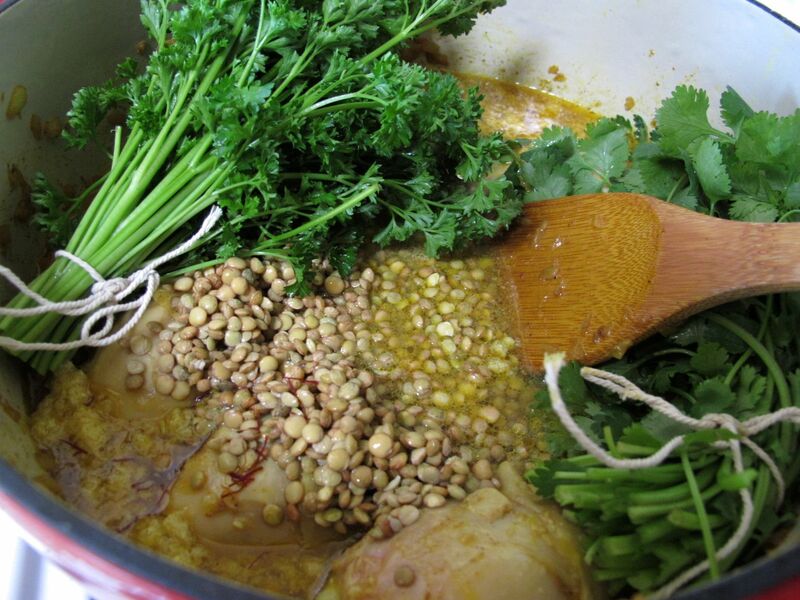 Pour over the 2 3/4 cups water, then add the (soaked and) drained lentils, the soaked, drained, and ground fenugreek, the bunch(es) of cilantro and/or parsley, the pinch of saffron, and the remaining 2 Tbsp. of olive oil. Cover and simmer for 30-35 minutes, stirring occasionally. 4. After it’s been simmering (covered) for 30-35 minutes, uncover to allow the liquid to begin to reduce. Continue to simmer (uncovered) for an additional 30-35 minutes, stirring occasionally at first, but then checking on it and stirring it frequently during the last 10-15 minutes, since the extra liquid should disappear, and the lentils could easily stick to the bottom of the pot and burn once that happens. 5. Meanwhile, peel tomatoes by slicing an ‘X’ into the bottom of their peels, and sliding them into a small pot of boiling water for about 10 seconds each. 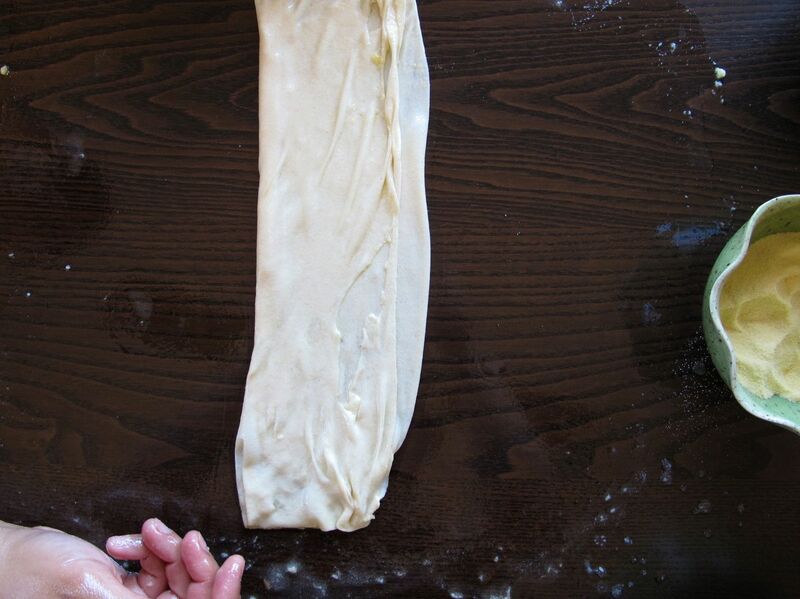 Remove with a slotted spoon, let cool, then pull back and discard the peels and roughly dice. 6. 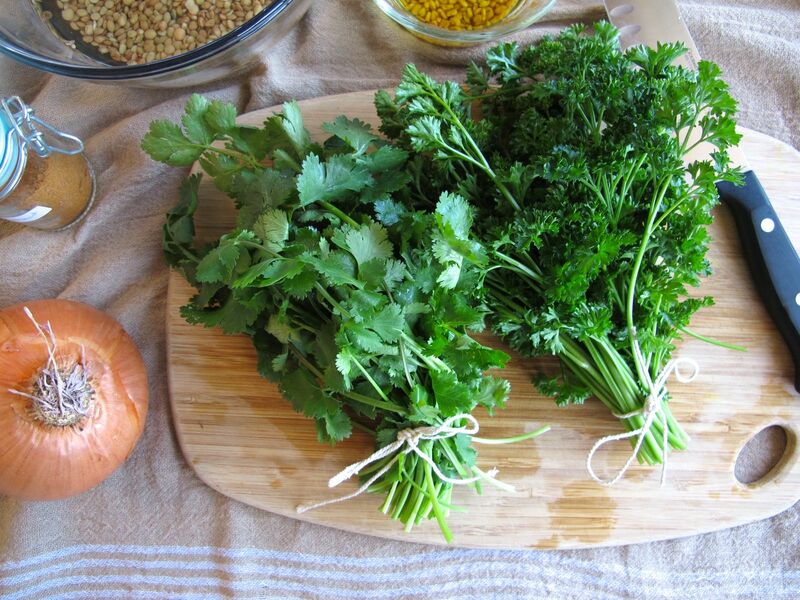 Once the liquid has reduced from the rfissa, remove it from the heat, remove and discard the cilantro and/or parsley stems that have not dissolved into the dish (in particular, remember to remove the twine! ), and stir in the tomatoes. 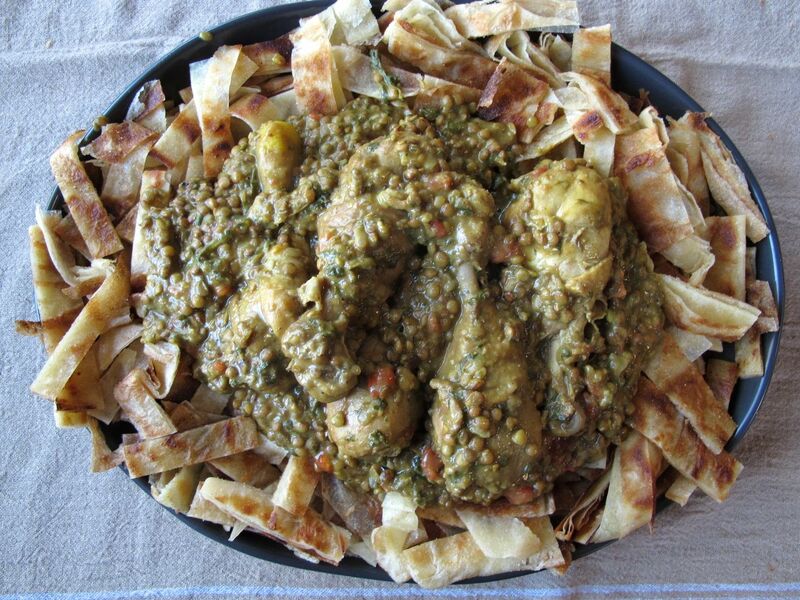 To serve: Arrange the sliced strips of fried msemen (or paratha) on a large serving platter (or in individual dishes), and plate the chicken and lentils over the strips of fried bread. I do the same thing! Fall in love with a dish then try to recreate it. There is usually an ingredient missing somewhere. :) This looks fabulous. Oh, wow, from the looks of it I can see why you kept at it. Looks/sounds delicious. Happy travels! OMG. How are you a real person??? This dish is amazing. I can’t believe you made the bread from scratch! This dish looks so good! I’m totally recreating this. I do what you do. I’ll get a dish from a restaurant stuck in my head for a year and then finally make it. Love this. Your photos are beautiful too. What a resource you are. I see that you also made hoddeok! So did I! I’m going to look right now. So excited to see this recipe. WOW. Haha, Amanda, I always love your comments! :) And let me second one of your sentiments: I can’t believe *Paula* made the bread from scratch! I’m just the one who whined/inspired her to do it! 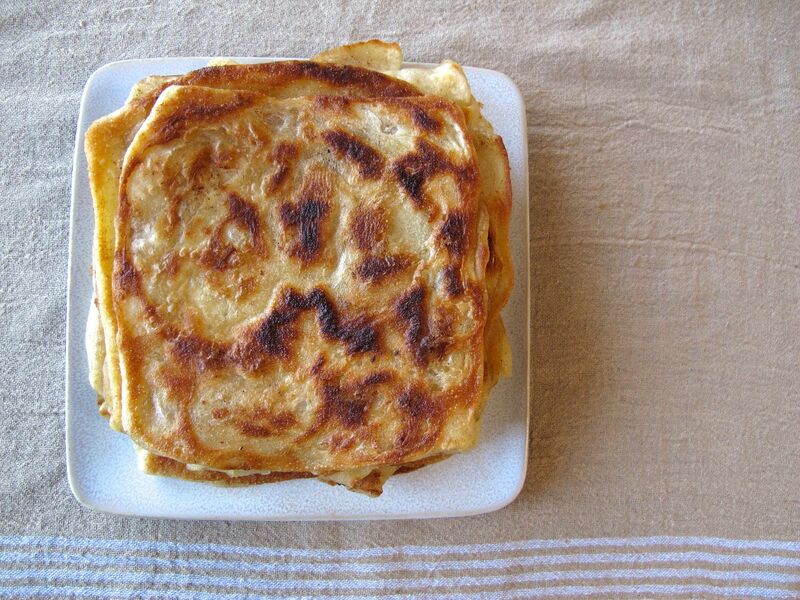 So cool that you made hotteok too! (Ours was also thanks to Paula… at my insistence.) I’ll have to check yours out! That sounds amazing. Welcome back. I want to hear all about it! What a coincidence you posted this!! I am in Brussels right now, and there is Msemen everywhere! On weekends I go to a local market where they make it fresh in front of you…lets just say I cant stop with one! 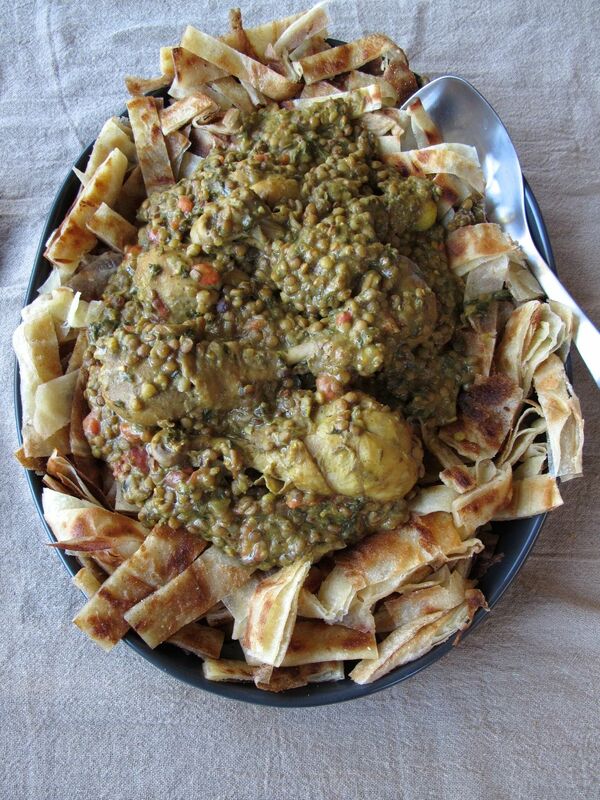 You are amazing for making it at home, this meal looks exiquisite!! You are certainly not the only one who tries over and over to re-create a specific taste! I’m still working through curry dishes. Harder than they seem! This looks delicious. 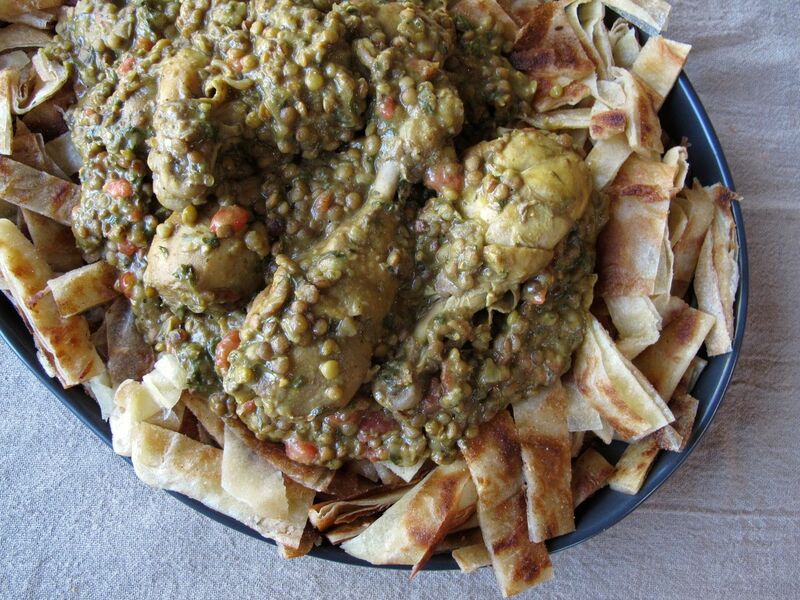 I love Moroccan food! I’ll definitely try this. Thanks for sharing the recipe. This sounds so good, and your description reminds me of my own kitchen philosophy, if you will. I can’t wait to give it a try! Yay, I hope you do give it a try, and I hope you enjoy it! :) Also glad to hear we share that in a kitchen philosophy — I love eating out at restaurants, too, I’m just constantly eating things at restaurants and thinking: hm… how could I also make this at home?! Ah, but definitely share the proclivity for food nostalgia. What a dish! I totally think about meals I loved over and over – you’re not weird! This looks absolutely divine! 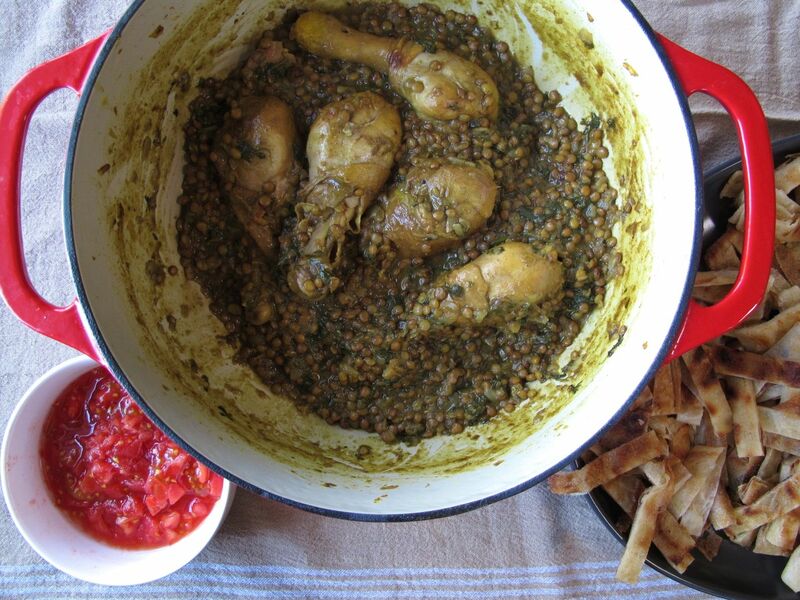 My husband hates lentils but I think I could get him to eat them if there was chicken and fried flatbreads involved. will do :) – have never read anyone describe it so well before ( I have wondered why I can remember the first time I had uni but not the names of anyone I went to school with) – it seems a bit odd – but it seems like I am not the only one :)! If I come up with a name I’ll let you know !